First of all, Happy New Year to all! We hope that this next year brings you what you want and hope for, and while 2016 may have been a rough year for many of us in many ways, the hope of a New Year means a fresh and clean start. This last year was huge for us as we saw many things fall into place in our road to becoming parents. We started 2016 thinking maybe “this would be the one”, only to be reminded that adoption takes long and is a lot of waiting. This is not without saying that we knew for sure that we would have a baby this past year, but maybe with some hopes that things would move a little faster, and while things did move in the right direction we were reminded that all that is good is worth the wait. We attended an incredible training with our adoption agency in which we were re-assured that we are doing the right thing and learned so much about the process. You can get a refresher of that by clicking here. After much waiting we (FINALLY) were ready to be taken off from the waiting list for the waiting list and then became a listed family and are officially waiting (hopefully soon) for a call that either a birth family has picked us or the agency got word from a hospital that a baby has been born and they believe that should be our baby. We are thankful that we were connected with such a great Social Worker to do our home study this year (click here to read some about it). The baby room is turning from just being our spare/overflow room into a real room for a child (still a work in progress though). We purposely wanted to wait until all the other steps mentioned above were met to start setting up the room. As you can tell, 2016 was a year that saw a lot of good moves in our life, and while we are still waiting for whatever comes next, we are grateful that things have taken the time they have. It is easy for people to say “it shouldn’t take this long to adopt” or “why does it take so long to adopt?”, but for us this has been perfect timing as we have had other things happen this year (Danielle starting Grad school!) and even still working on some fundraisers (as we finally started paying for some of the expenses that come along with adopting. We don’t know what this new year will bring but we are sure this crazy and wild adoption adventure will continue, and we are excited to share it with you all! Happy New Year 2017 from the Guerreros! 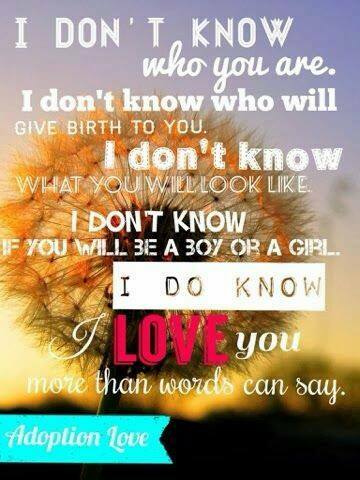 A dear friend of ours that is also an adoptive parent shared this on our Facebook this week. These words resonate so much as we think, pray and already love our future child (children, let’s be honest!). We have no idea what he or she will even look like or where he or she will come, but we already love our kid, more than words can express! As the days get closer and as we continue to raise funds to adopt you, we love you more than you will ever know. Someday you will make us a lucky Mom and a lucky Dad.